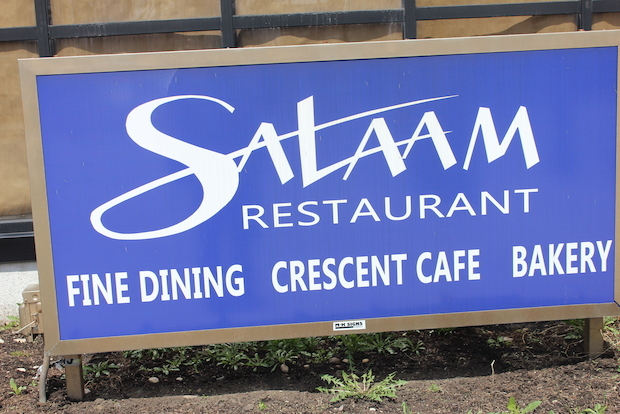 AUBURN GRESHAM — The unexpected closure of Salaam Restaurant & Bakery surprised some community leaders and left them wondering if it would reopen. Several key figures in the area were unaware the restaurant had even closed, although some Auburn Gresham residents said the restaurant, 700 W. 79th St., which is owned by the Nation of Islam, hasn't been open for two months. A sign on the door at Salaam informed customers that it is temporarily closed for renovations and would reopen this month. No inside renovations were taking place Monday, Tuesday or Wednesday when DNAinfo Chicago visited. Across the street from Salaam is Respect For Life, a bookstore, and the Final Call newspaper building, both owned by the Nation of Islam. An employee at the bookstore, who declined to give his name, said Salaam is open from 12-5 p.m. on Sundays. Demetrius Muhammad, who oversees Salaam for the nation, was unavailable for comment. Salaam first opened in 1995 but closed in 2000. In July 2012 it reopened following a $5 million upgrade, Nation of Islam officials said at the time. Those who didn't know Salaam has apparently shut its doors included Ald. Latasha Thomas (17th), whose ward includes the business; Carlos Nelson, executive director of the nonprofit Greater Auburn-Gresham Development Corp.; and the Rev. Michael Pfleger, pastor of St. Sabina Church in Auburn Gresham. Pfleger said he spoke to the Nation of Islam leader, Minister Louis Farrakhan, "not long ago and he said nothing about the restaurant closing. "If it does not reopen it would be devastating to the community because Salaam is an Auburn Gresham jewel," Pfleger said. "I loved their homemade coffee rolls in the bakery. I ate those all the time." Resident Julius Newman said what concerns him the most about the closure is it being another eyesore to the community. "It's a big, beautiful building sitting on the corner of 79th Street for everyone who drives pass to see," Newman said. "There are too many abandoned buildings in Auburn Gresham. We don't need another one." Added Thelma Jordan, an 18-year resident who lives in the 7800 block of South Union Street: "I hope it reopens ... because I would hate to have an empty building on my block that size."